Did you know that fast fashion is the second dirtiest industry in the world after oil? Gross, I know. It’s easy to craft a villain out of oil spills and toxic waste dumps. It’s harder to imagine it hanging in your own closet. A little background: before your clothes ever wind up on your back, there’s a serious of steps it crosses. These steps include supply chains, raw material sourcing, manufacturing, shipping, retail display, and eventually disposal once you’ve tired of the garment or if the garment doesn’t sell. That’s a pretty big carbon footprint. Enter: Krista Sison. Krista is the founder of Multitudes Studio — a creative platform that uses art and fashion to promote sustainability and social awareness. It comes with its own line made of “rescued” materials; fabrics Krista saves before they hit a landfill. Q - How did you get here? Have you always been concerned about sustainability in fashion? What was the moment you decided this was something important to you? A - I left my hometown in a suburb of Cleveland to study fashion design at Parsons in New York. It was too expensive for me, so after a year and a half I decided to transfer to Columbus College of Art & Design. After college, I moved to LA with my boyfriend, who now runs the photography side of my business. On our many camping trips within California, I was able to experience nature’s beauty on a much bigger scale. Those trips are what made me realize the importance of protecting the environment. I’ve worked for many fashion brands over the years — from Abercrombie & Fitch to BCBG to Juicy Couture. I had always heard or read statistics here and there about the unsafe labor practices in the industry, but I witnessed a lot of the injustices through my own work environment. It was probably around 2016 when the documentary The True Cost came out on Netflix. It really broke my heart; but in a way that was just the right amount to motivate me to change. I remember being in an ethical crisis for the rest of the year! 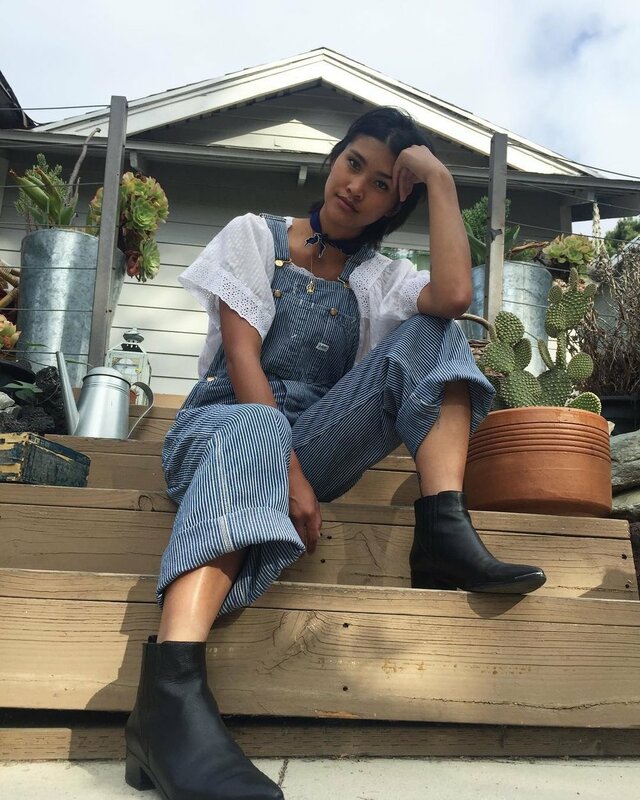 Q - You did an initiative where you wore the same overalls for an entire month to showcase how diverse a piece can be. How was that? A - I had heard about this fashion blogger who created this challenge called One Dress to Impress. Basically, you pick an item to wear for the entire month and you style it with a fresh perspective every day. I chose a pair of vintage railroad stripe Dickies overalls. All my friends knew that I was doing it, and would get so excited to see what new outfit I came up with the next. It was a great conversation starter for when I met new people. It prepared a platform for me to talk about shopping more consciously. The message I really want to get across through these wardrobe challenges is that you only need a little to make a lot. You just have to be creative. Q - You had a piece in your line - the Mixed Race Button Up - in which you featured poetry from Geramee Hensley. Tell me about it. A - This was one of my favorite pieces in the collection - I bought one for myself. We took one of my cousin’s poems and embroidered parts of it onto upcycled button up shirts. Geramee is an amazing writer - I’ve always admired how he transforms ordinary words into poetry. He is Filipino Italian and writes a lot about being mixed race. My favorite line in that poem we embroidered onto his shirts was “doesn’t matter if you ain’t Chinese/you still gonna get called chink”. I found these lines to be so confronting for my white friends, and relatable to all my POC friends. Q - What's your favorite piece from your line-up? A - The Denim Quilted Patchwork Jacket has a special place in my heart. I put over 30 hours of work into this one piece. I hand picked each fabric scrap, quilted each piece of fabric, and sewed it all together on my 10-year old machine. Every part of it is made from rescued materials except for the quilt batting on the interior. I think it’s so cool that a stack of denim scraps all ended up coming together perfectly for this one jacket. Q - If someone is looking to be more sustainable in their life outside of what they wear, what can they do? A - The best thing outside of clothing is to reduce your plastic consumption. Both fashion and plastic are attacking our planet and we are letting it happen right before our eyes! WE are actually the hands causing the destruction and we just haven’t taken ownership yet. Reducing plastic consumption is so easy: buy a reusable water bottle, stop using straws, refuse the lid, start using reusable groceries and produce bags, switch to glass food containers. There are so many small things you can do! Q - Anything cool you're working on currently? A - I’m working on an all-yellow drop this year with a printmaker Lukaza Branfman-Verissimo from San Francisco! It’s already in the works and I am really excited. The artist is amazing and really creates a dialogue around prioritizing people of color and the LGBTQ community. It will have upcycled items and custom pieces like last time, but this year we are also adding some naturally dyed pieces! Q - What's been some challenges you've faced as a female entrepreneur in such a saturated industry like fashion? And what advice would you give those trying to do the same? A - Fashion is a selfish industry with an insane amount of useless competition between women. It’s sad to see that in today’s world and in a “progressive” city like LA. Everyone is afraid of their spotlight being stolen. I’ve put people at the heart of Multitudes and dedicated my time to showcasing others, so I’m never worried about that. I know that when I lift others up, I feel good. It’s a been a big challenge for me to find a brand that shares the same values, but sometimes if you don’t like the way the system works, you have to get creative and make it work for you. Photos courtesy of Krista Sison and Multitudes Studio. You can learn more about and shop at www.multitudesstudio.com.